We are committed to provide an optimum rang of Tungsten Shielded Container For Viral Transport to our valuable clients and customers. Being amongst the prominent manufacturer and supplier of tungsten alloy bars and containers, we are offering a well designed metal container. This type of shielded container widely find its applications in automotive sectors as the name of the product reflects itself. 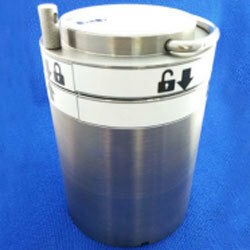 The top of this Tungsten Shielded container is locked by a fixed joint. It can be well equipped with an inbuilt handle, which enable it for an easy transport. The weight of the offered product is 14 kg with pit and external dimensions (mm) 33mm x 57mm (ÃÂ x h) and 93 mm x 130mm (ÃÂ x h) respectively.